Montgomery County, Pa., is home to nearly 100 miles of trails, and I am on a mission to explore all of them. 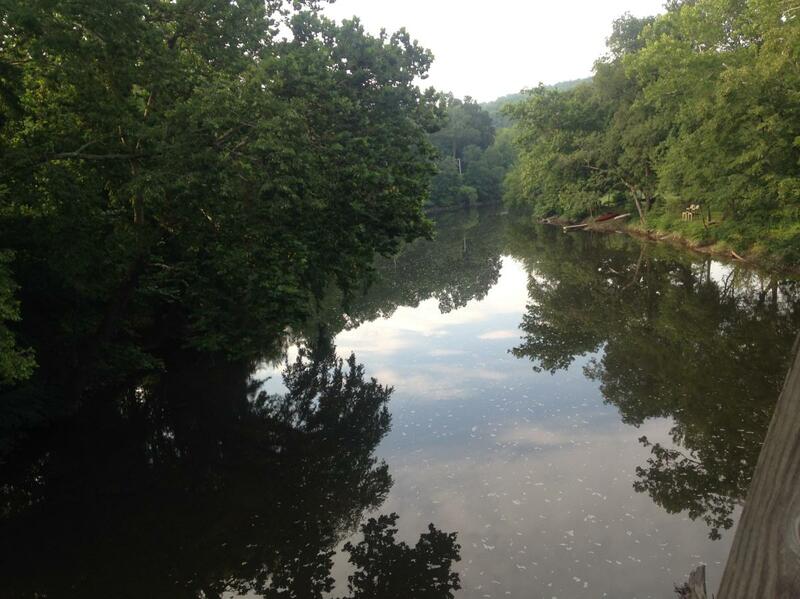 This week, I grabbed my bike for an early morning bike ride on the Perkiomen Trail. 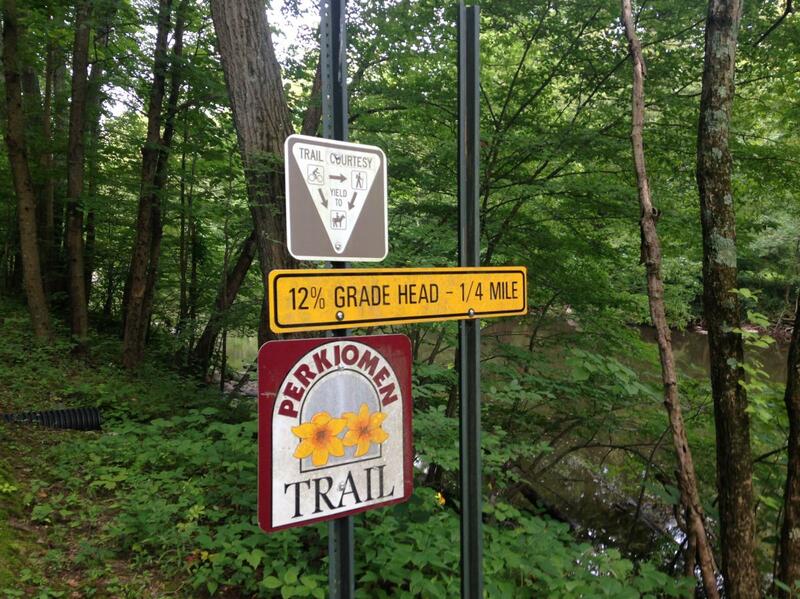 The 20-mile Perkiomen Trail makes up more than one-fifth of Montco’s nearly 100 miles of trails, carving a path north-to-south from Green Lane Park to Oaks. I wanted just a little more for my ride so I set my destination a few miles farther south – the Visitor Center at Valley Forge National Historical Park. Park-to-park, the trail would carry me through small towns, up and down a mountain, and across open fields, always within shouting distance of the Perkiomen Creek that lends its name to the trail. I started out in the early morning hours from the parking lot on the north side of Deep Creek lake, site of the park’s amphitheater, a playground and picnic area. The trail loops around Deep Creek Lake, but I took a shortcut across the bridge, through the adjacent parking lot and onto the trail, which runs along the shoulder of Deep Creek Road for a brief stint before turning off into the trees. The northernmost sections of the trail are developed, but there are a pair of brief stretches where riders must either share the road or use a widened shoulder before the trail truly comes into its own. One of the hallmarks of the trail in this early section is the road crossings. The trail meanders through the villages of Salford and Spring Mount before the real fun begins. Just south of Spring Mount, about five miles into my ride, was the biggest challenge I would face during the day: climbing Spring Mountain. The warning sign comes one-quarter mile before the climb. A 12% grade takes riders up a 200-foot ascent to the top of Spring Mountain before shooting down the other side. I couldn’t do it and had to hop off. It was the only climb that I couldn’t handle on the route, but I knew if I was going to make it 22 miles, I couldn’t spend all my energy this early. As hard as the ascent was, the descent was scarier. The trail is paved going up the north side, but it’s all gravel on the downslope. It’s very easy to build up too much speed. Jumping a rut or missing a corner are real possibilities if you aren’t watching your speed. At the bottom of the hill is Schwenksville and flat riding between the town and creek. The trail passes by restaurants and a bike shop with a convenient trail-facing Coke machine for thirsty riders. 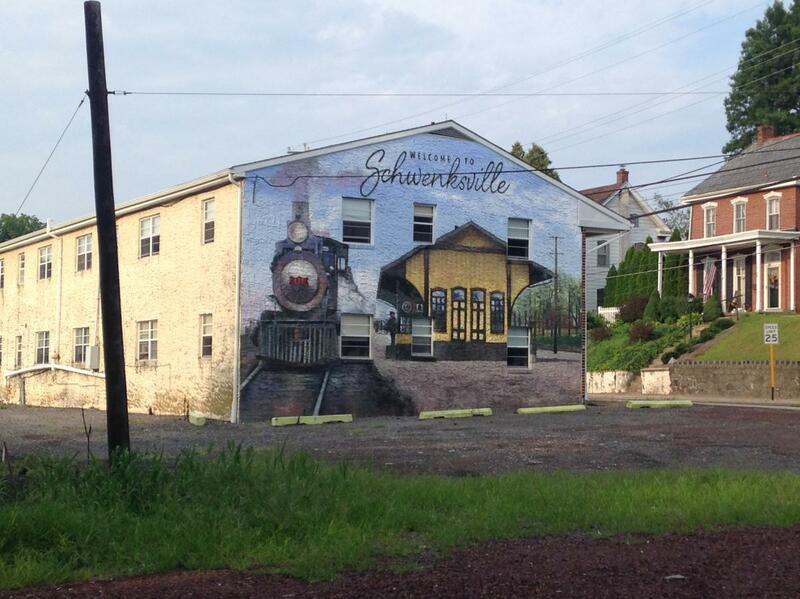 In Schwenksville, you’re riding on a rail trail. It’s flat and straight, except for one awkward detour up to street level and around a pair of homes before returning to the route. 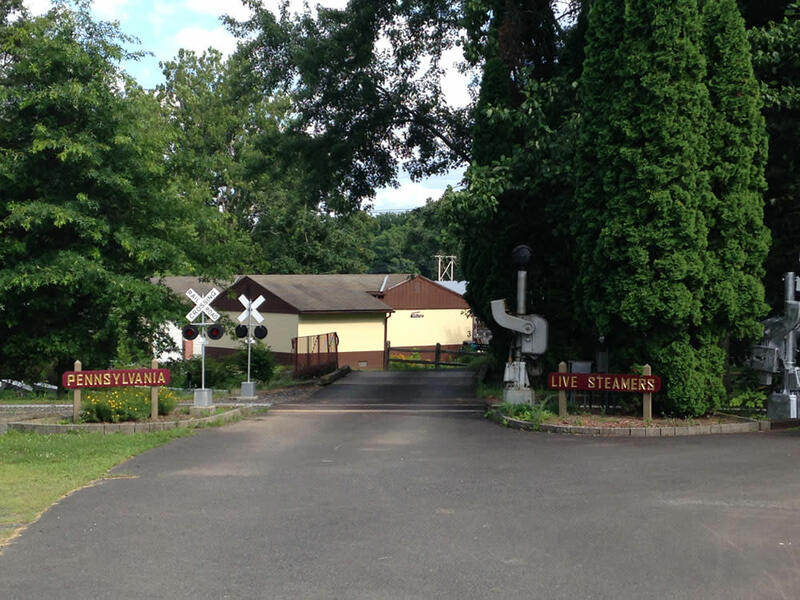 The trail continues south through the community of Graterford, past the trailside Vincent’s Pizzeria & Grill, the Graterford Trailhead and the clubhouse for the Pennsylvania Live Steamers, a group of scale-model steam engine enthusiasts. Just south of Graterford, the trail crosses over Route 29. This is easily the most dangerous crossing on the route as cars speed by on the busy road. 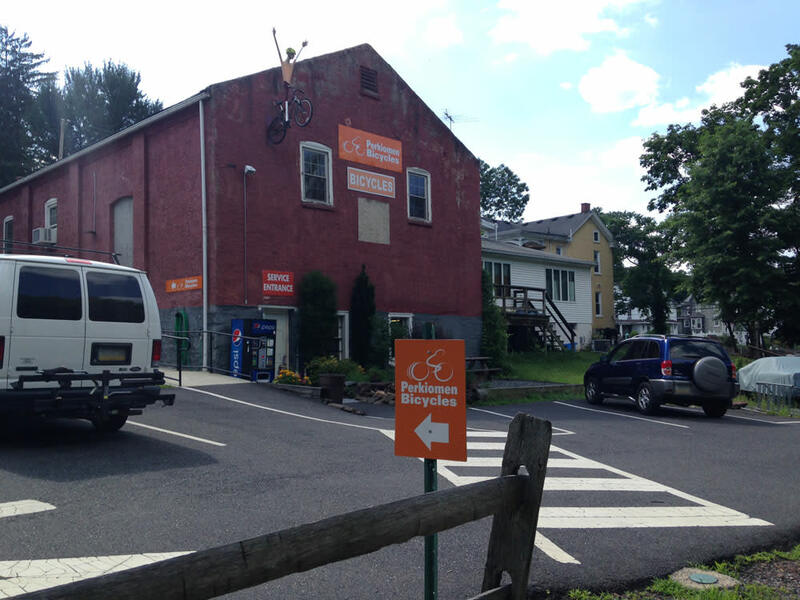 This also marked mid-point in my route, though the symbolic midpoint was just ahead in the town of Collegeville. 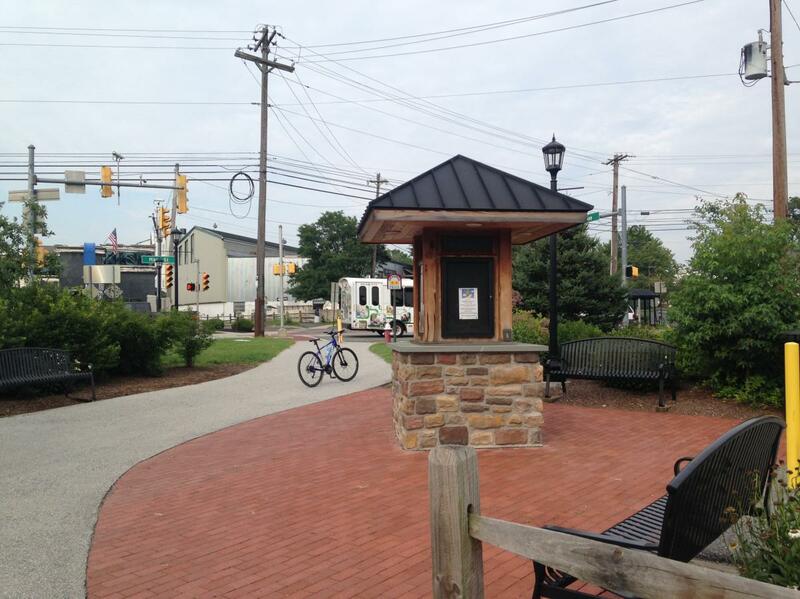 Collegeville is home to Ursinus College and is the largest town serviced by the trail. The gravel path gives way to pavement at the intersection of Main Street and Third Avenue. DaVinci’s Pub sits on this corner, and if you’re looking for a hearty meal or to grab a quick drink, this is the place. If you’re looking for something a little faster – say, pizza – The Pizza Stop also sits along the trail. You’ll also find a diner, fast food restaurants and a variety of sit-down places within a two-block section of trail. 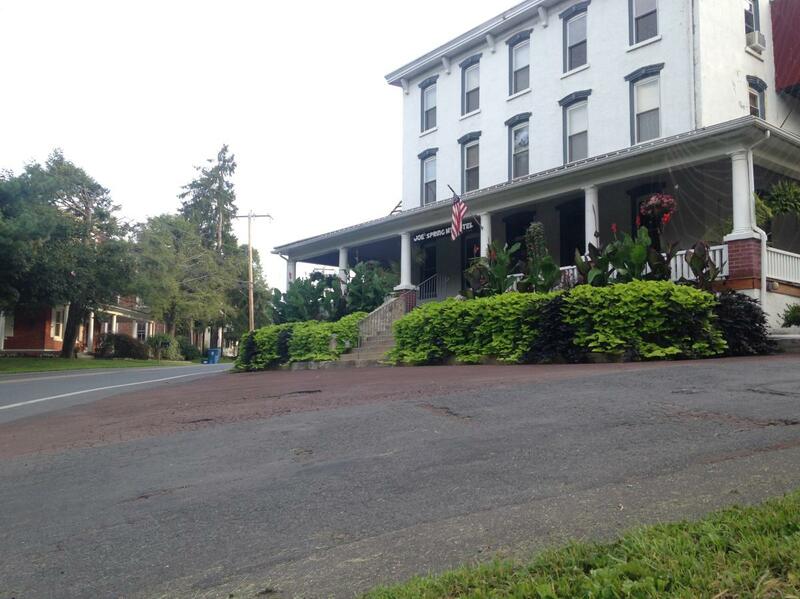 Collegeville is an ideal place for a break, whether you’re riding the trail or just writing about it. 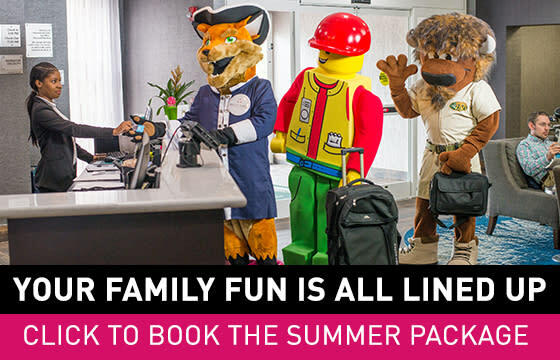 Check back next week as I continue my trek south to Valley Forge.